Emma founded Frog2Prince after spending extensive time trolling online dating sites for men. Frustrated between what she saw online and what she saw in person, Emma began offering consultation to friends and family looking to reveal their inner prince. Emma's idea took off, so she brought her expertise to the public. Emma believes that all men can use the internet to their advantage, but they sometimes have trouble showing off their best qualities. 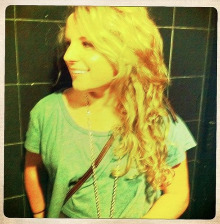 Emma is a 20-something writer and experienced dater living in Boston. After graduating from Clark University with a degree in English, Emma dove into the world of online dating, perusing profiles and meeting lots of men-- they always ask her for a second date. In her free time, Emma tries out odd restaurants with friends, reads (she loves Franzen and Murakami), writes poetry, dines with her boyfriend (who she met online), and listens to Emmatronic Euroclub, her favorite playlist. She loves running half marathons. Emma wants to hear your comments and suggestions. Send a love letter to emma@frog2prince.net or tweet @froggy2prince. You can also reach Emma at 1-844-EMMA-WRITES.